Place names come and go, but the land remains. An enquiry from a cousin about the name of one particular headland near his home in Manawaora Bay, Bay of Islands, started Murphy Shortland on a five year quest to record the pre-European names of the eastern Bay of Islands. 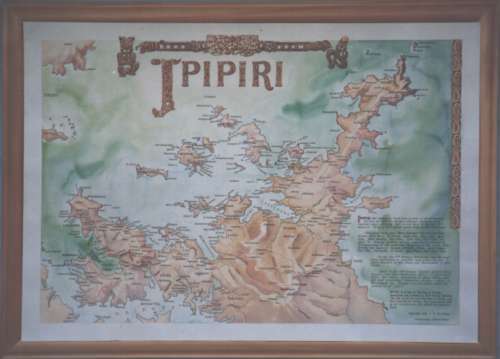 The result is a map which he has called Ipipiri, a name used by the Maori to refer to what Captain Cook named the Bay of Islands. Murphy also used the whakapapa of local tribes to confirm information he extracted from Land Court minutes. This enabled him to identify chiefs who were selling particular pieces of land in specified areas. Along with the place and landmark names came information about associated events and people. Kaiwaka, a bay near Tapeka, was the site of a massacre between two local tribes in the 1800s. This incident had been recorded in Land Court minutes but forgotten by locals. But when the Moerewa freezing works were being extended in the 1940s, sand was taken from the beach and bones from the fight were uncovered. Not only the name of the beach, but also knowledge of the historical event had been almost lost. The map reaches from Taupiri Bay in the south to Ngaiotonga, part of the Waikare Inlet, all of Te Wahapu, Kororareka, Okahu (Urupukapuka) Island and Motukokako (Piercy) Island in the north. The original of the map, drawn and painted by Denis Brown, is on long-term loan to Russell Museum, mounted in a frame of kauri hand-carved by Anita Jones of Motatau. Full colour, limited edition, unframed prints (850 x 590 mm) of Ipipiri are available from Murphy Shortland for NZ$150.